UNIQUE Internet Marketing Database Software Saves You At Least 33 Minutes Of Your Valuable Time Per Day! Busy online marketers: Boost Your Productivity And Reach New Levels Of Success… Or We’ll Give You Your Money Back! It’s when you’re urgently looking for some ‘VITAL’ piece of information - something essential for your business and you haven’t got a clue where you saved it! Admit it - even if you’ve just been doing business online for a few months, you will already have a mountain of files relating to it, right? Keywords, and a hundred and one other things…! Let's face it: Just keeping track of them can be a real nightmare. And it’s not something you can just ignore. “I just downloaded the demo and after 5 minutes realized, you have created the product of my dreams. I am in the beginning stages of my online business and I have piles and piles of paper with notes, ideas, articles, sites to revisit etc. and it is becoming unmanageable. I was wondering, how I would cope with my information overload. ... “First, allow me to congratulate you on a very clever and extremely useful piece of software. It is very easy to understand... is powerful and it looks good. It will be fun using it... and that says a lot! For ages now there has been a crying need for someone to create a database program specifically designed for the Internet business owner. Promo Buddy™ is that software! “... When I got the program, I soon realized that this program has a lot of very useful functions for any active Internet marketer. 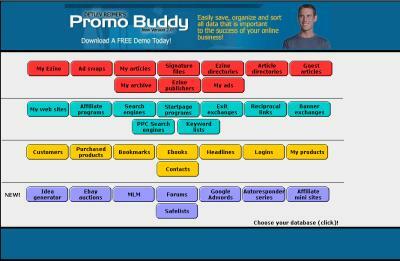 In short, Promo Buddy is an excellent tool for organizing your whole ebusiness and all your tools. Seldom have I been so positively surprised by a software product. In my opinion, Frank has produced one of the most useful software programs for any active Internet marketer, that I've yet seen. It's a fantastic product, and I strongly recommend that you invest in it as soon as possible. You'll thank me that you did! It's that good." I've considered almost any strategy for promoting your ezine and website. Both things which will make you a lot of money if handled correctly. Especially, if you are a very busy Internet marketer and you have both, an ezine and a website, plus several dozens of affiliate programs and related data, you will know that your time is valuable. Now picture this: You've just written a new solo ad which promotes your most profitable affiliate program paying you $125 in commissions... You have been thinking for hours about a terrific headline and how to lead the reader into your opening paragraph and then you can't find it on your computer anymore. It's gone ! You neither remember how you named the file nor in which directory you had saved it; scary vision, isn't it ? This can't happen to you with Promo Buddy™ as the data (the ad in this case) is directly saved into the database. By the push of a button, you'll have that data at your fingertips and everything that is related to it ! You need Promo Buddy™ or would you, in the mentioned scenario, rather like to write your carefully composed solo ad AGAIN, wasting hours of your valuable time?? Or another scenario: How often has it happened to you that you joined a new affiliate program and when you want to start promoting, you can't find your affiliate link...Where is it? "I know, I must have saved it into a *.txt file but where exactly did I put it into? I really can't remember..." Mmmmhhh, sounds familiar ...? In fact, 15 minutes after you start using Promo Buddy™, you’ll wonder how you ever lived without it. Unlike some programs that take up your precious time Promo Buddy™ will actually save you hours of time. ”Now keeping track of my online business promotions and customer database is a real breeze. You have definitely thought of everything that an online marketer would need to keep organized and I wouldn't hesitate to recommend it to anyone doing business online. Promo Buddy™ Is a bargain at any price...great job!" "I honestly KNEW I had to have this addition to my business management software as soon as I opened up the demo! Promo Buddy™ is spectacular, Frank, and will enhance the business management products that my husband made for me, his marketer/publisher wife!" 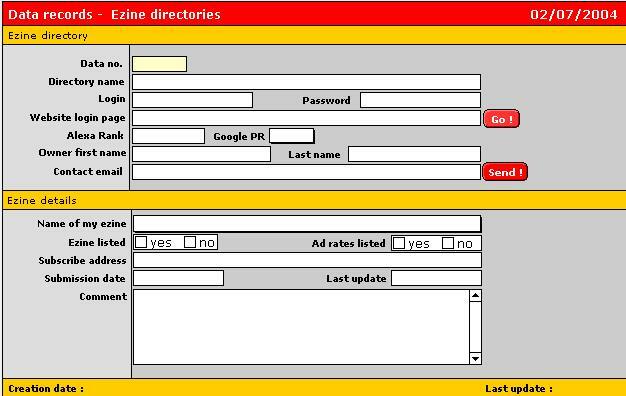 Ezine directories - Now you can keep track of your ezine directory submissions and use a checkbox to make clear if your ad rates are listed as well. This should give you an overview about how well you are doing in the directories. 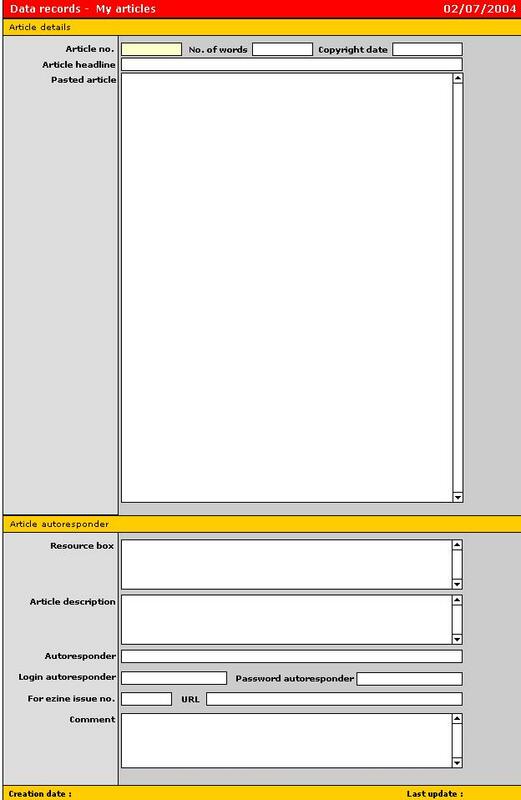 However, the program is not intended for actually DOING the submissions. My ezine - Put in every single detail about your own ezine(s) into this database. 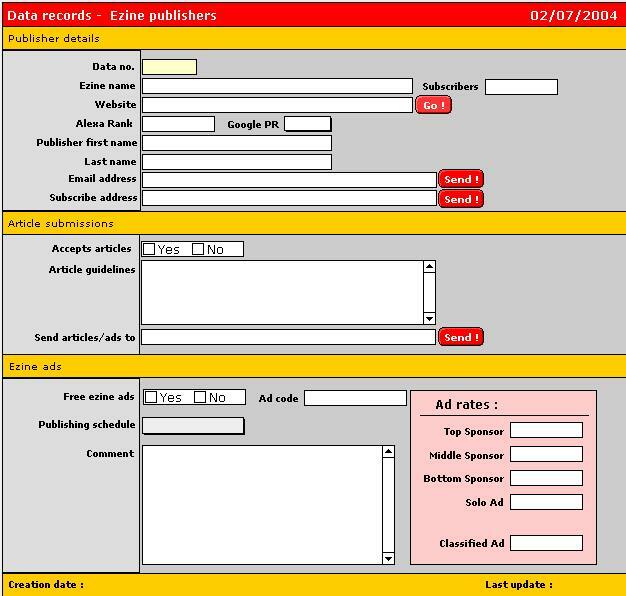 Name of your newsletter, number of subscribers, your ad rates, online archive URL etc. etc. 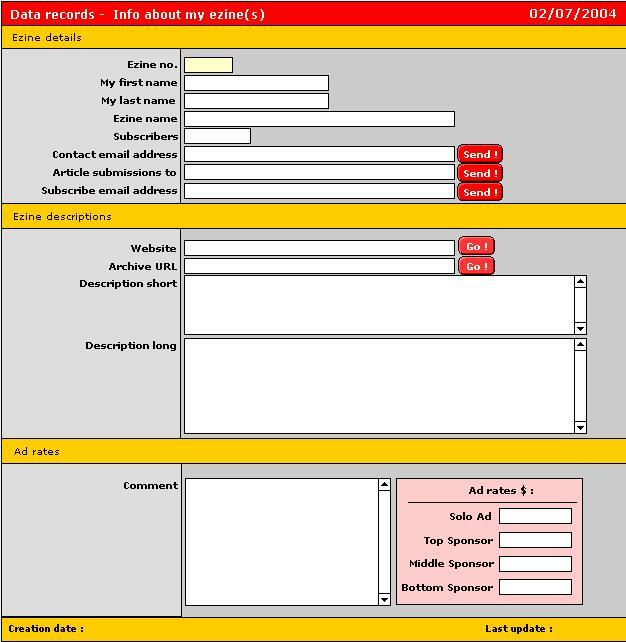 Your archive - You can easily create an archive of all of your published ezine issues together with the date and the URL where they can be found online. Your articles - You can easily create an archive of all the articles you have ever written. Writing articles is one of the best methods to get the word out about you and your web site/ezine! 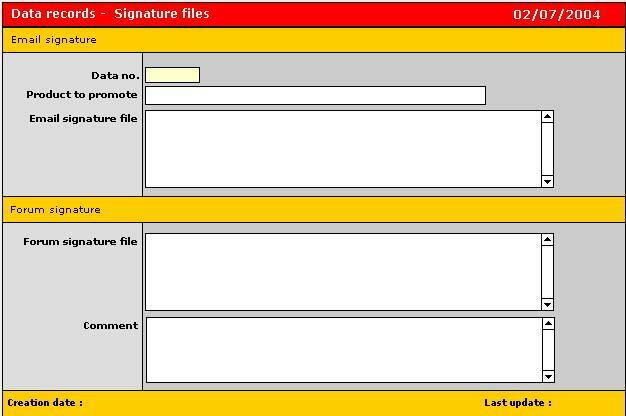 Signature files - A great free way to promote your ezine or website is the use of signature files in your emails or when you post to forums. Now you can easily keep track of them with this signature file database. 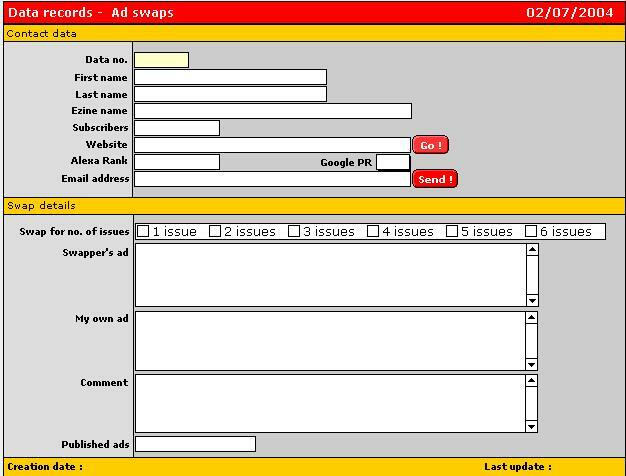 Your ad swaps - Here, you can enter the details about your ad swaps. Which ads you've swapped, with whom you did the swap and for how many issues. 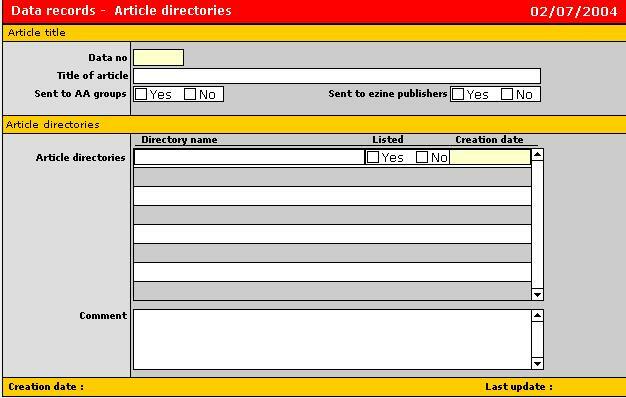 Article directories - You can keep track of all your article submissions. Ezine publishers - Compile a personal list of your favorite ezine publishers which are accepting article submissions, free ezine ads as well as paid sponsor ads along with their ad rates. 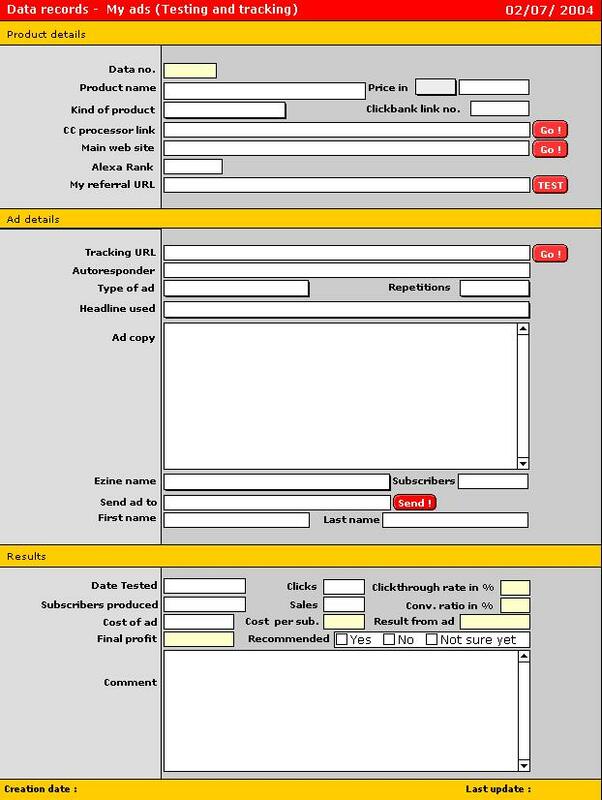 You can also list their ad code, which you'll need to submit any free ezine ads they might offer you. 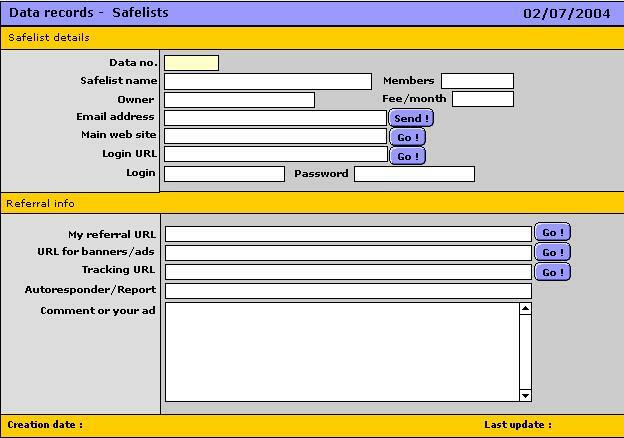 My ads -This is a very complex database if you're taking the number of fields into account and it can be called "the heart of this database program". It has almost any field you can think of for your paid ezine ads. Insert your credit card processor link, the product which you want to promote, your tracking URL, the autoresponder which promotes your product, the headline you want to use. You can paste your ad copy into it and, of course, the name of the ezines for your ads. List their number of subscribers and how many repetitions you want to do for your ad. It will even calculate your profits and your conversion rate ! I am new to the world of computer marketing and I just wanted to take a moment to tell you how absolutely satisified I am with your product: Promo Buddy. My business is based around product design, manufacture and marketing of the product. I especially find the "Idea Generator" and the "My Products" areas most helpful to me. If I come up with a new idea for an item I wish to design, I can quickly jot it down while it is fresh in my "creative logic". Then, once I have completed a design and it is ready to market, the description part of the "My Products" area helps me to keep the description uniform throughout the various web sites and auctions where I offer the product. The entire program helps me keep everything about my products, my web sites and my business organized and neat. This is great for cost, insurance, and tax purposes. Every designer/manufacture/retailer should own this program! How can I affiliate so I can recommend this product outright to people I know in my field?" 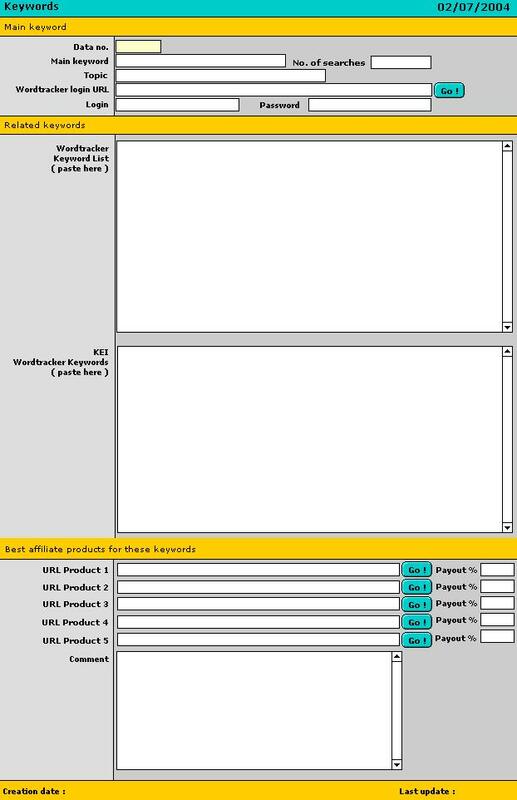 Affiliate programs - Within this module, you can add the details about your affiliate programs. 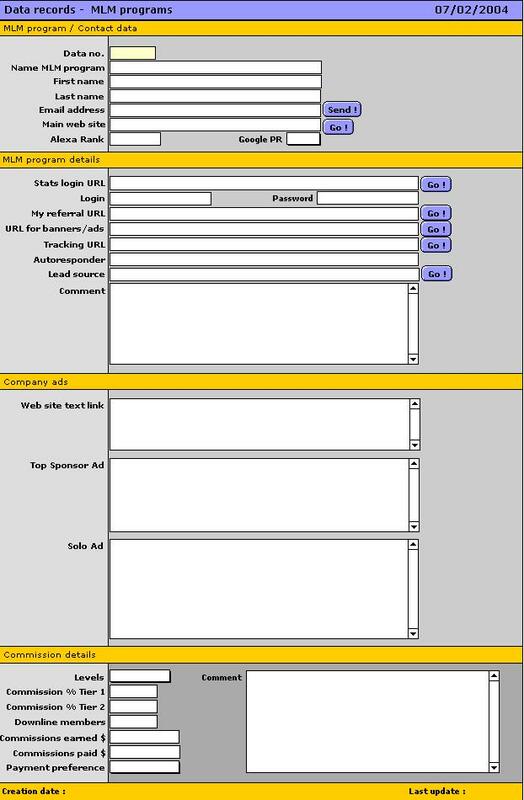 These details include logins/passwords for your affiliate area, your referral URL, tracking URL, any autoresponders that promote your affiliate product and the URL for your promotional material such as your ezine ads and banners. 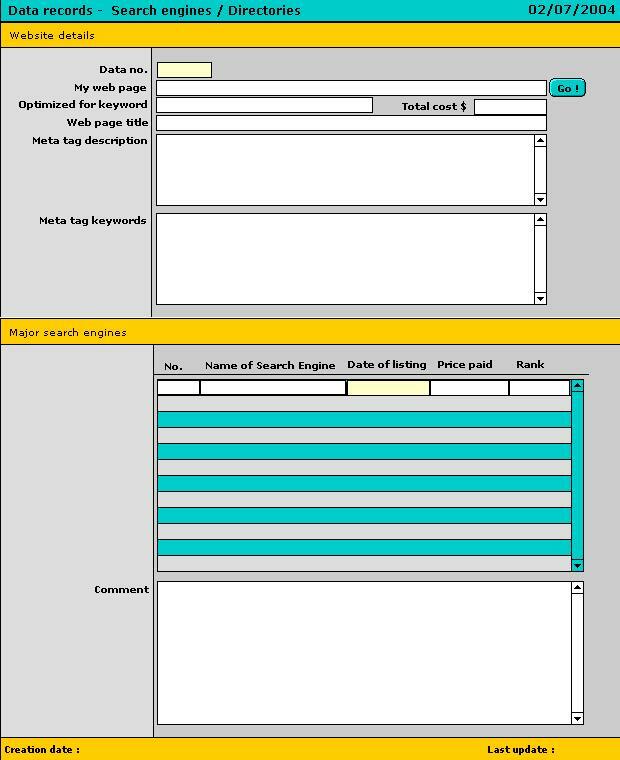 Search engines - Here, you can select the URL of your search engine submissions and enter the keywords. See if you're already listed with the search engines. Then you can also list the position your site has achieved. Add your meta tags as well. Pay-per-click (PPC) search engines - This module allows you to monitor your pay-per-click listings at paid search engines like Overture and Findwhat. You can list your keyword phrases and descriptions together with your bids and it will also calculate your profits! (sales minus cost of clicks...). Startpage programs & Exit exchanges - Add all the details about any startpage programs and exit exchanges which you are using on a regular basis. 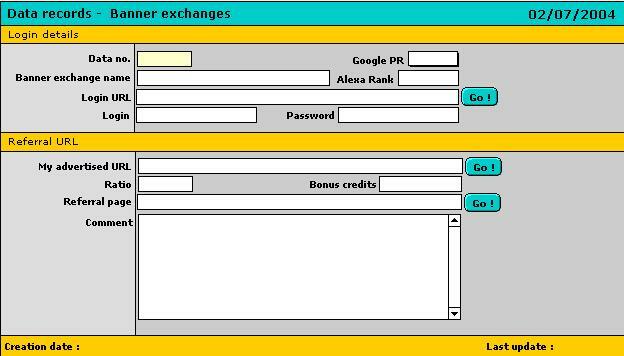 Add the number of bonus credits for referrals, your referral URL, surfing URL, site rotator and login details. Your Banner exchanges - Similar to both modules listed above. Your Keywords - This one will list any specific keywords, which you've assigned to certain URLs. New: Paste your Wordtracker keyword lists into it - Keywords/KEI lists! 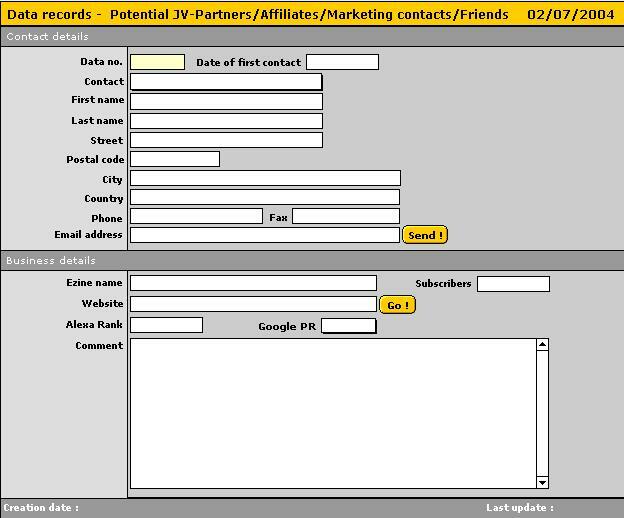 Your Contact Database - Enter all the details about your affiliates, JV partners, marketing contacts and even your personal friends. 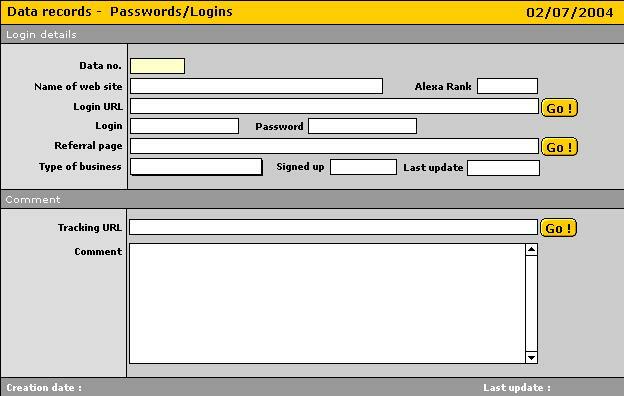 Your Logins - Allows you to store all of your logins for: membership sites, FFA page admin details, BizOpps, Safelists etc. etc. You can even create your own categories for those. Plus, you can also list your referral URLs. 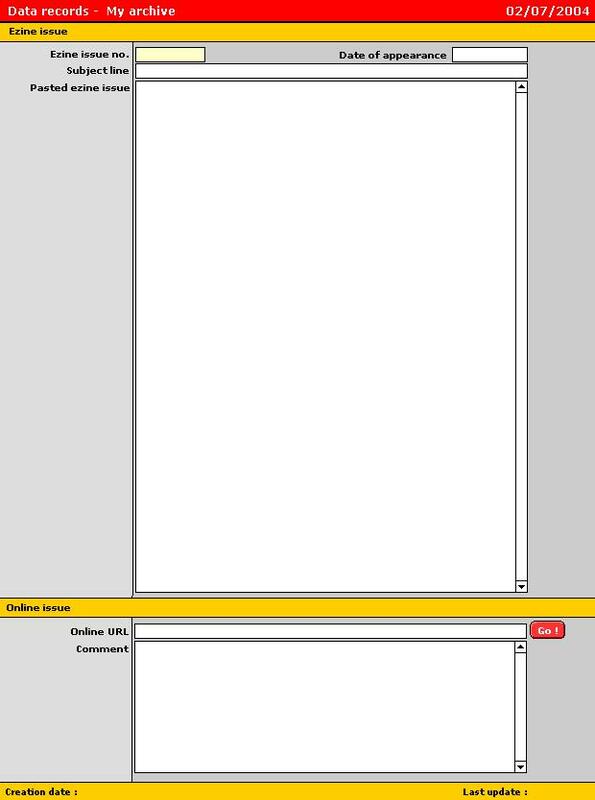 Your Headlines - This is a section where you can experiment with the creation of new "Killer Headlines”. List your most successful headline examples in the drop down menu and start turning them into your own "moneymakers" by changing and tweaking headlines which already have been proven to work. It’s a headline rolodex on steroids. Your Ebook Database - In this database, it's possible to list all the ebooks which you've downloaded and enter details about your purchase, the content and if you can resell/ distribute it. You can also enter an unlock code which is necessary for some ebooks and you can evaluate the product in a range from 1-10 where 10 is the highest score. But the best thing about it is that you can START your ebooks by just pushing a button! NEW: NOW YOU CAN ADD EBOOK COVERS INTO THE DATABASE! NEW! 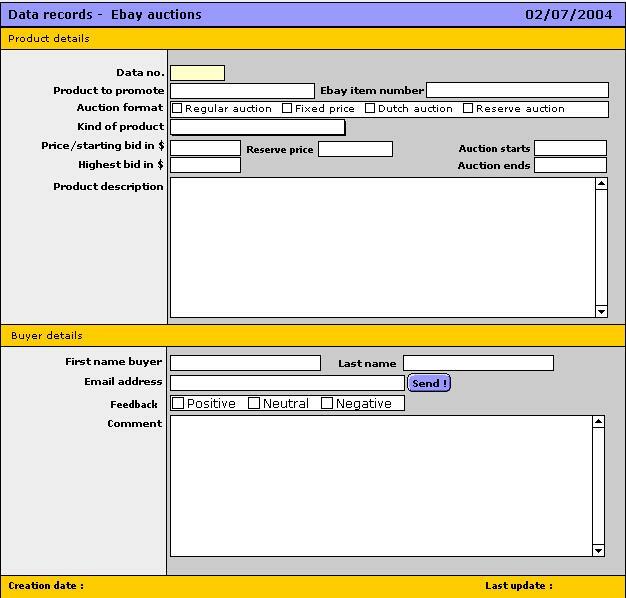 Ebay auctions - Keep track of the products you are selling on Ebay and who your buyers are. NEW! MLM - By popular demand, I've added one database specifically for MLM programs only. Add all your details into this database and you'll never forget anything related to this homebusiness again. NEW! Forums - Add your favorite forums to this database. Make it a habit to post to these Internet marketing forums very often and by participating in those discussions, your website gets known as well because of your signature file which you are allowed to add. NEW! 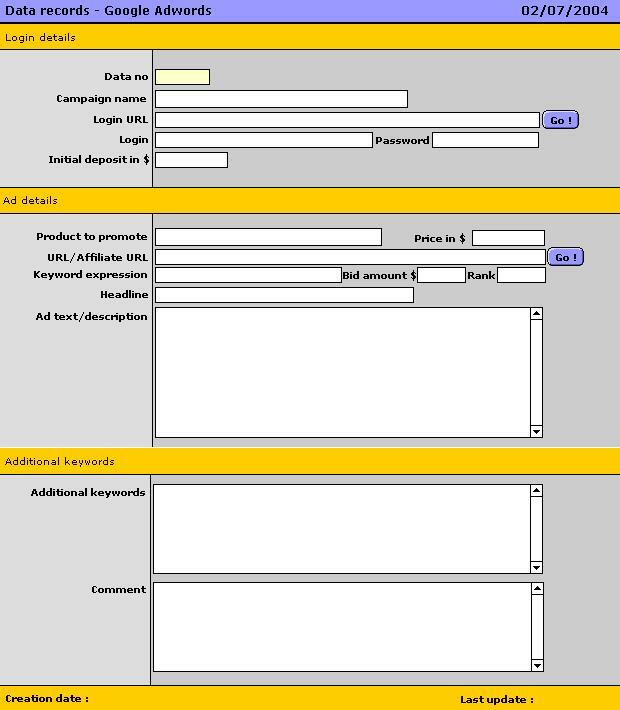 Google Adwords - Again, by popular demand, I've added a database just for Google Adwords. This way, you can have local copies of your ads in Promo Buddy and adjust them to your campaigns. NEW! Autoresponder Series - If you have a lot of affiliate programs you are promoting, you'll have a lot of message series as well which are used to pre-sell your customers. 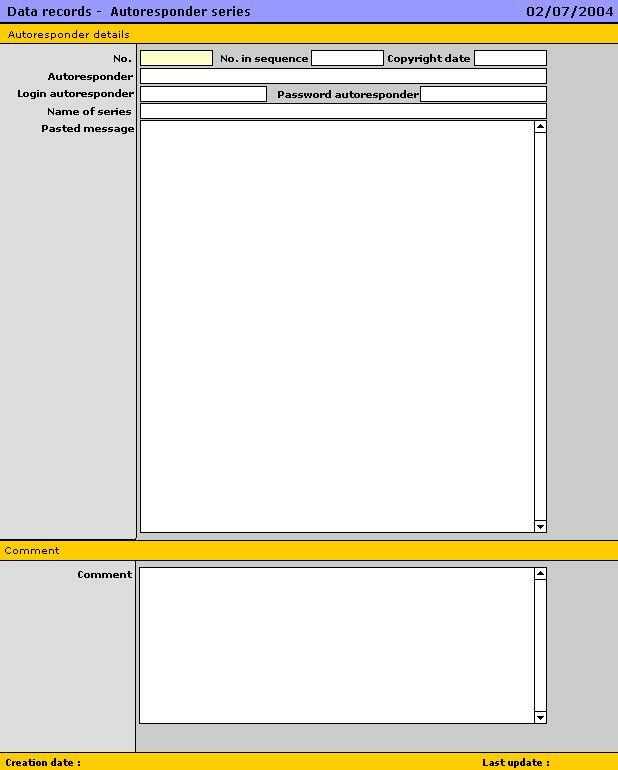 Now you have these messages at hand without having to login into your autoresponder to view them. NEW! Affiliate minisites - As it has been taught by Phil Wiley, you need to build yourself some minisites which are promoting your affiliate programs. Use them to pre-sell your customers. 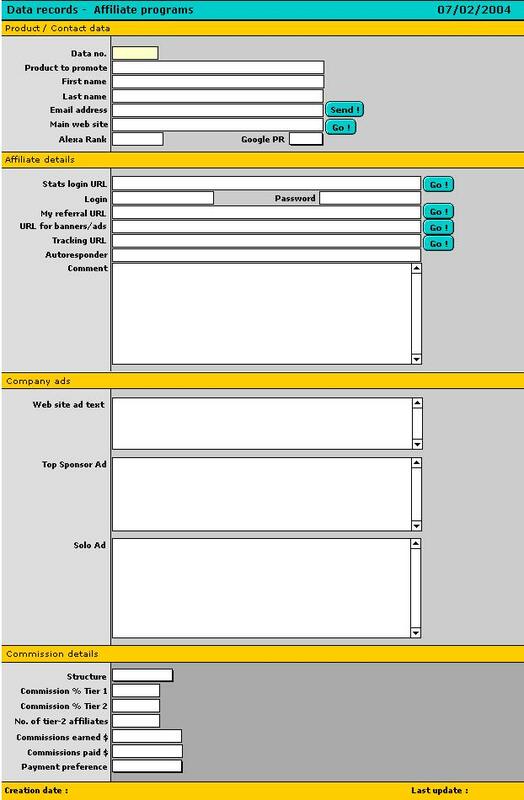 In this database, you can add all the details about your web host, domain registrar(s), merchants, keywords etc. NEW! Safelists - This had been included in one of the other databases but you told me, you wanted a separate module for it and I listened. So here it is: A module which you can use to save all of your details for the safelists you are using. You can even save your ads in there...! ... I believe Frank has done an excellent job of incorporating the various modules using the power of the FileMaker Pro program and I am very happy to have the opportunity to work with it. I believe anyone running an Internet business, whether they have their own product or are affiliates would find this program to be extremely helpful. I, for one, am going to take the time to enter all of the information so I can get my business more organized and will use it on a daily basis. Thank you Frank." 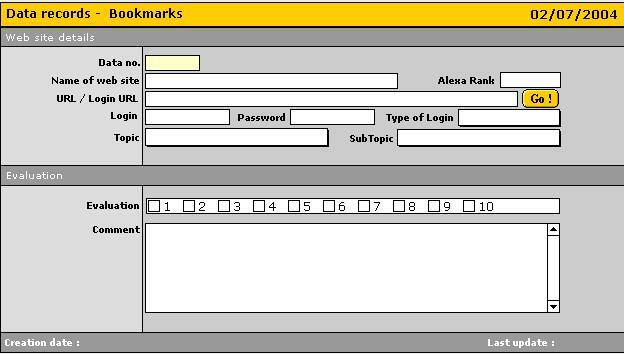 Your Bookmarks - Are you always having problems with finding your bookmarks? This module will solve that problem once and for good! Your Purchased Products - Enter the details about any of your online purchases, whether it is software, information or access to membership sites. It's especially a good place to save your receipt numbers in (just in case you want a refund...). 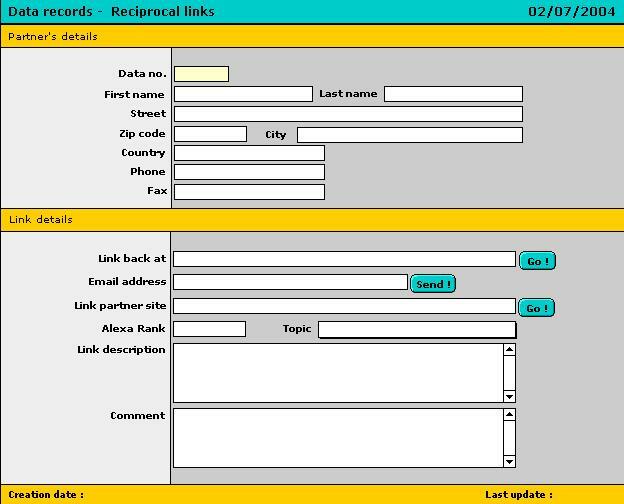 Your Reciprocal Links - You have them on your web site, these reciprocal links but after some weeks, do you still remember with whom you have exchanged links with? Do you still know their first name and WHEN you had exchanged the links? If you choose one of the data records, you can even see all the emails you had sent to that person, provided you're using the integrated email manager. 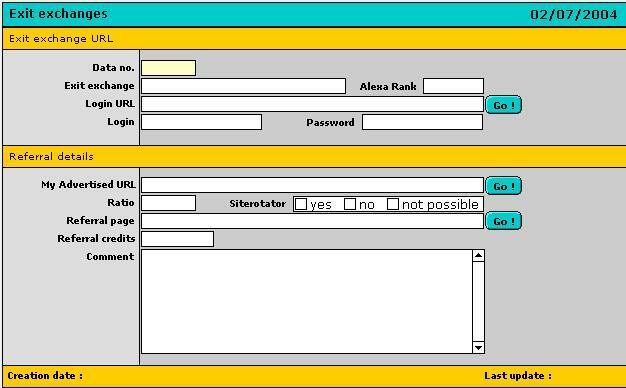 You can create the message within the database and then it is being sent with your default email program. NEW! Your OWN DATABASE!! - I've saved the best for last... 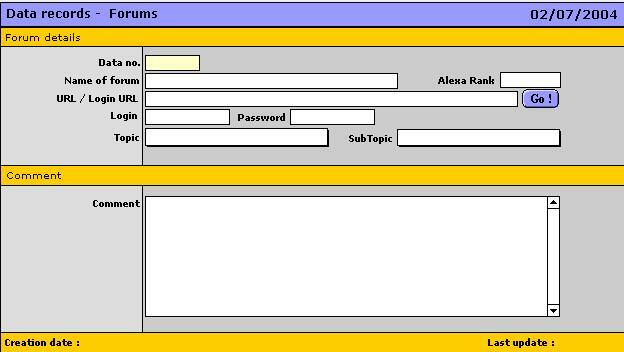 If, for whatever reasons, you don't find the database you need in Promo Buddy, I've added one database which allows you to add your own database name and descriptions. Use it for anything else you might want to keep track of. 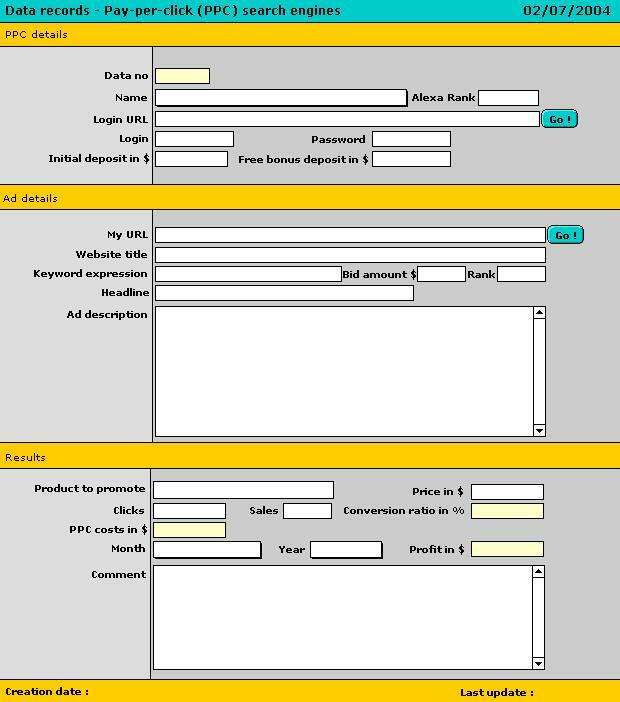 There are 6 text fields, 4 number fields, 2 URLs and 2 email addresses and 1 comment field which you'll have at your disposal! "Sometimes a product comes along that changes the way you do business. 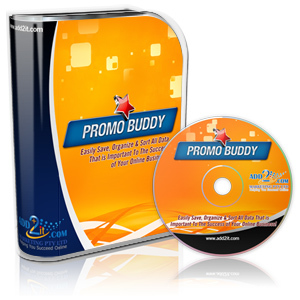 The Promo Buddy™ Software is that type of product. Specifically designed for online business owners who are serious about their marketing campaigns. Promo Buddy makes organizing, testing and tracking your entire marketing campaign a breeze. I am so impressed with this software that I have no hesitation in recommending it to everyone who wants to seriously organize their marketing." Why did I create Promo Buddy™? Well, I'm not a kind of software guru or a high paid computer programmer. I just happened to be in the lucky position of learning something about the creation of databases with a program called Filemaker Developer and the idea was born to create this program. Not for the purpose of selling it but rather to become better organized myself. I went on to develop more and more modules for the database until I thought I had taken care of almost any promotional activity that could possibly be important to your success as a serious online marketer. I have done countless tests to make sure every inserted field would perform its' task well. Sometimes, I even worked way into the middle of the night because I wanted to get it finished. And now I'm really happy that I can be using it myself, in the first place. I've already reached my goal of creating the product and putting it into action. And I know how much better you'll feel, once you're experiencing for yourself, how easy it is to become organized! "Greetings Frank ! Your NEW software makes me happy...I really love it! Promo Buddy is a must-have tool for *all* online marketers to get organized; perhaps they don't realize it, yet, but Promo Buddy is so easy to use....even my 6 year old nephew could get around with it. Well done Frank ! Thank You for this GREAT tool ! " 1. You won't have to use 3 or 4 programs anymore to save your entire Internet marketing data! 2. 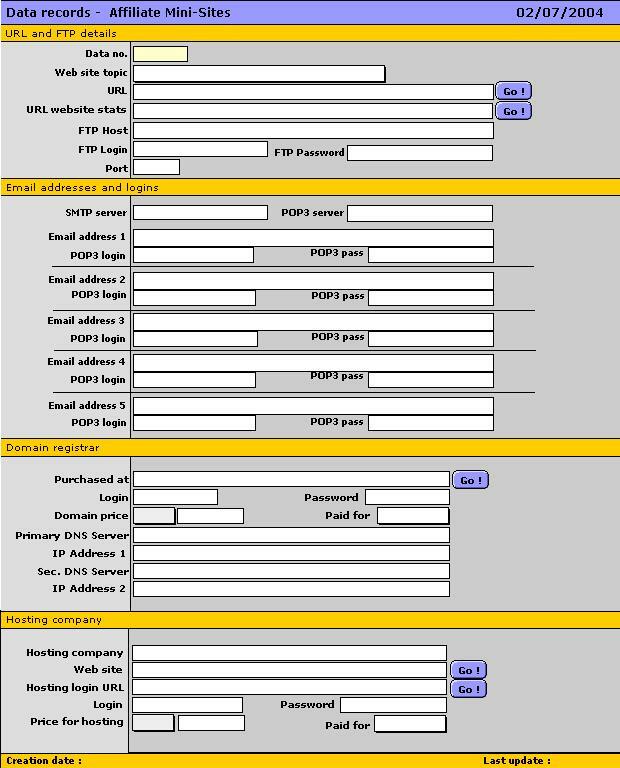 You’ll be able to sort your data by multiple sort criteria and print it out! 3. You’ll finally have an organized system for your online business! 4. Never lose your download URLs again! 5. Organize your ebooks by topic, evaluation or content, include details about your resell rights and if a website and sales letter comes with it + include the ebook cover picture! 7. My customers are important to me. What about yours? Create a database with all your customers and view at a glance which of them have brought in the profits for you and WHAT they've bought from you... Now you can offer your best customers special discounts because you actually know how much business they've brought to you. Give them the care they deserve! 9. Organize your ezine! It is one of your most important tools for making profits! 11. Be inspired by proven successful headlines and create your own moneymakers! 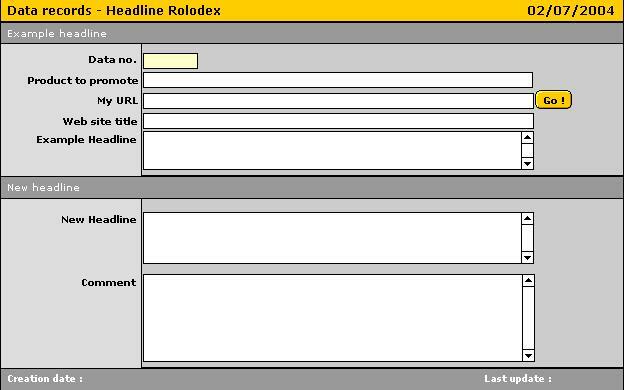 You can add some of the most successful headlines into your headline rolodex and you'll never run out of ideas for new, creative and profitable headlines. It's a real creativity enhancer in this regard...! 12. Keep track of every single keyword on every page of your site! How many pages has your website? If you've got more than two or three, it will become quite difficult to remember all of those keywords, which you've always wanted to use for some of your URLs. Whether you need them for search engine optimization or PPC search engines, you'll only have to add them once into the keyword database and then you’ll always know which keywords you had assigned to your URLs. 13. Easily see how much profit your ezine ads have made! How many clicks you converted into sales? With this innovative software you can see this. Actually, the database "My ads" calculates your profit from your solo ad or whatever kind of ad you've used and it will calculate your clickthrough rate, your conversion ratio and your final profit. If it is a negative value, it is shown in red so you'll know at a glance that you've lost money with your ad! It will also save the date when you've tested the ad and this allows you to create a kind of "advertising success diary". 15. 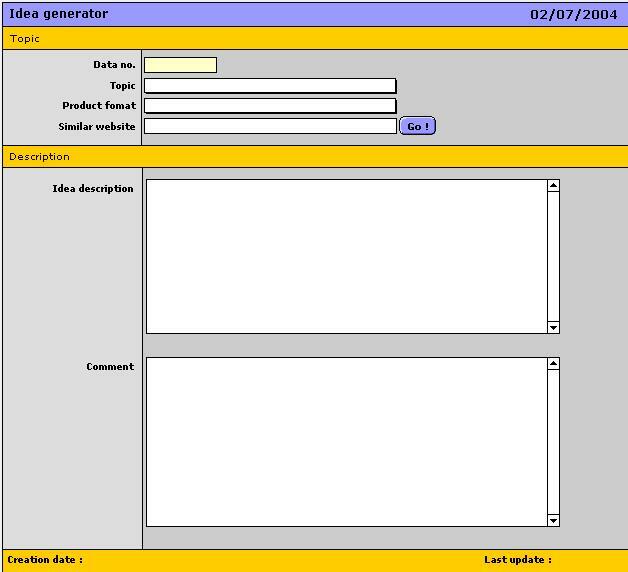 Create your own database!! I've added one database which allows you to create your own field descriptions and then add any kind of data into the fields you want... 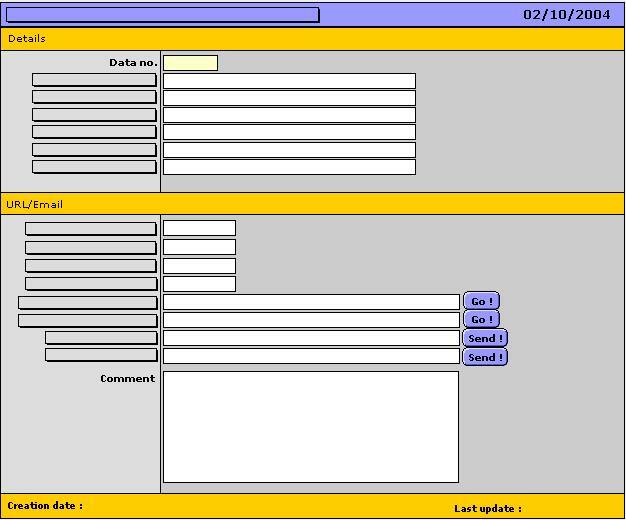 So if there's missing a database you would have needed, create your OWN! I simply love Promo Buddy™ and so will you...! ... It was simple to get going with it. I had it installed in less than 5 minutes and was putting it to great use within the first half hour of using it. The only drawback, I found was that it was missing a few categories, I would have liked to see. A quick email to Frank, about these suggestions, and I am told they will be added to a future upgrade. Check it out. 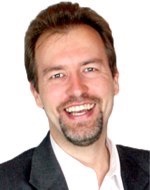 Like all great software, you can try a limited version before you buy it, to get the feel of the program." You could be using this powerful software within five minutes from now... Immediate download, no delivery costs and worries about shipping. Now I don't have to! 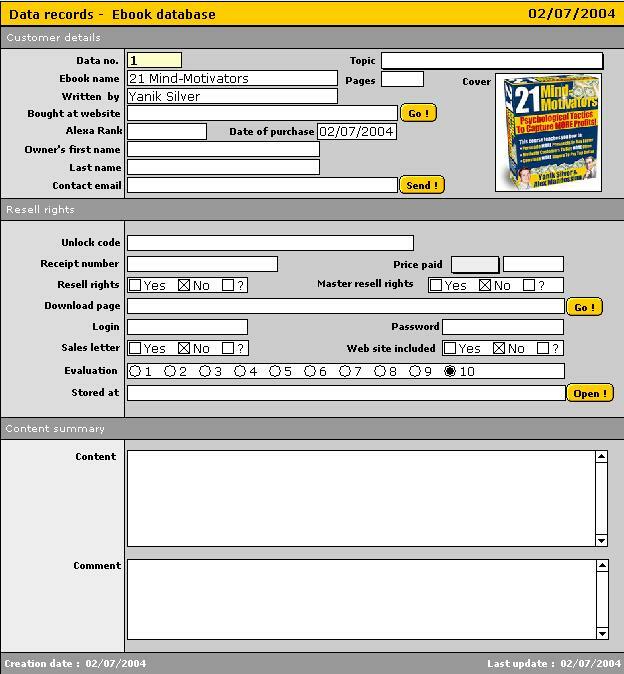 And the reason why this software turned out to be a tool that's an absolute must, I'm convinced, for anyone who is serious about their business, is that it was planned and developed by a marketer, rather than a software designer. You knew exactly what we needed. You covered all the bases. Thank you! I owe it to my subscribers to recommend it! Okay, so why am I being so generous? Simply put: I know once you're experiencing all the powerful ways of organizing and saving your marketing data, you're going to be a loyal and eager customer (and hopefully you'll even tell your friends and colleagues). I believe the only way to build a great business is to over-deliver. And that's why you also get a 100% risk-free, 30 days money back guarantee! Here's how it works: Try Promo Buddy™ for at least 30 days... Then, after putting my Internet marketing database software to the test and you don't think this program is worth at least 10 times the amount you paid, I'll buy it back from you! And the bonuses and all the other free gifts are yours to keep no matter what! Is that fair or what? 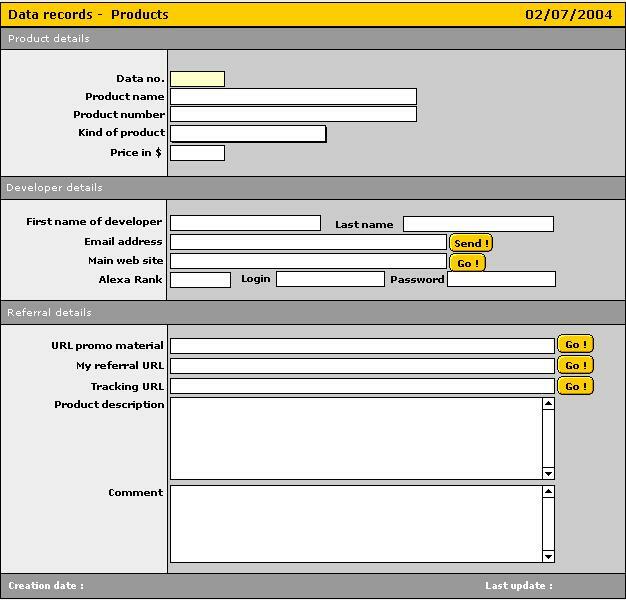 How many hours would it take you to create this internet marketing database yourself (e.g. in MS Access)? 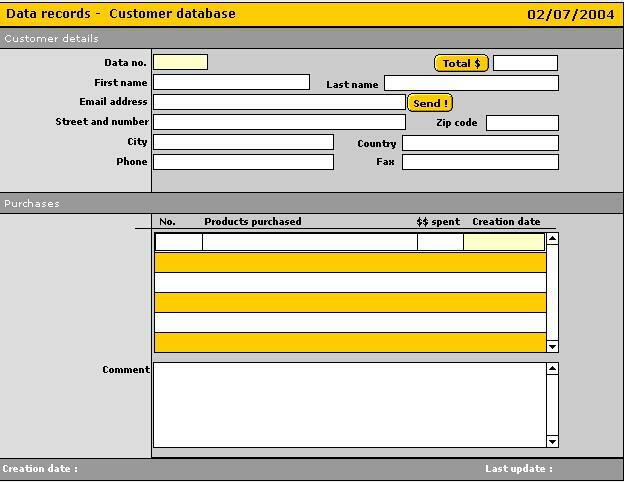 If you have some experience in creating databases, you could probably create a database like this yourself. But how many hours would it take you? I've already gone through the complete process of creating this ready to use product for you. It has taken me more than 90 hours to get it completed. Now just think about cost here. If I would get paid a very low hourly rate of let me say $20 (which is nothing for a database programmer...), you would already have to pay me $1,800.00 for this program! And if you would hire a professional programmer to develop a database especially customized to suit your needs, you would at least pay him $50 per hour which would then add up to $4,500.00 ! But I'm not charging you anything near to that. As you've already seen, I could easily charge $1000 for the software and would still be very low priced. But I want you to be able to afford it so I'm offering it to you for a very special price - it's almost a gift...! "Hi Frank, I just wanted you to know that I've bought your program and I think it's fantastic!!! I've been wanting something like this for quite awhile now. Thank you, thankyou, thankyou! Also, knowing I can resell it is wonderful!!" You can have the result from all my working efforts served on a silver plate ... ! Would you really like to decline my offer? My friends are telling me that I'm selling it way too cheap but I always answer them that I want to make sure as many serious Internet marketers as possible should be able to afford it. There shouldn't be a moment of hesitation just because of the price especially if you relate it to the value of such a programming task. ----->> Minimum System Requirements : ~1 GHz processor and 256 MB RAM. This is a MS Windows-compatible version only (sorry MAC users...)! So the risk is entirely on my shoulders, not on yours...! Think of all the time you could save on organizing and saving your marketing data. Isn't that worth a measly $97 $67 ? "Frank, my friend, what a wonderful product you've created! What a great time saver! I feel like I'm more organized than I've ever been. And let me tell you I'm not at all a disorganized person. But your 'Promo Buddy' is just excellent! I will recommend it to all my friends!" Are you a professional Internet marketer or NOT ? Order now via 2Checkout (https) for the all time low price of just $67 and download this breakthrough software! Goods and services provided by Add2it.com Marketing Pty Ltd (NSW, Australia). P.S. : I'm doing a price test here. If I see that the demand is high enough, I can change the price back to $97 at any time. You will not be notified of this. So it COULD be that the next time you visit my site, the price is up $30. Do you want to risk this? P.P.S. : In 5 minutes from now, you could be using this software and start getting organized. Just unzip the files from the zip file and start the Promo Buddy setup file. It will guide you through a very simple installation process." Don't hesitate any longer and remember that you also have a risk-free 30 days money back guarantee. That's how convinced I am that my software will be exactly the product you have been looking for. If you're not completely satisfied with your purchase, then you'll get your money back, no questions asked...! !